I'm planting peas, onions, and potatoes in the garden today, so the 2016 garden season has now begun here! Actually, I planted some peas in a few large containers on our deck last week (they have already sprouted!) AND I have a ton of seedlings growing under T5 lights in my living room, so I guess my gardening season started awhile ago, but since I'm planting OUTSIDE today, it somehow feels more official. As you may know, 2015 was a particularly busy and stressful (i.e. very BAD) year for me and I didn't have a garden at all. I missed it a lot (not to mention that my pantry shelves are looking pretty bare!) and I'm pretty excited about playing in the dirt again and trying to have my best gardening year yet. I'm well on my way to that too -- my seeds are all germinating and growing really well and I'm better organized and on schedule thanks to following GardenPlantingCalendar.com, a digital garden planting and growing calendar system I created. Peas are a cool season crop and can be planted as soon as the ground can be worked in the early spring. They don't produce well in warmer weather and they have a pretty short growing season, so it's a good idea to plant them as early as possible. Here in Virginia, the peas are usually done by early June and I plant other vegetables in their place after they stop producing. You can also grow peas in the fall garden too! Most peas are vines that send out climbing tendrils that will need to be staked for best results. The three most common types of peas grown in the US are English peas, snap peas and snow peas. While all three types are peas and are basically grown the same way, there are some differences between types of peas. English garden peas are what most people think of when they think of peas. 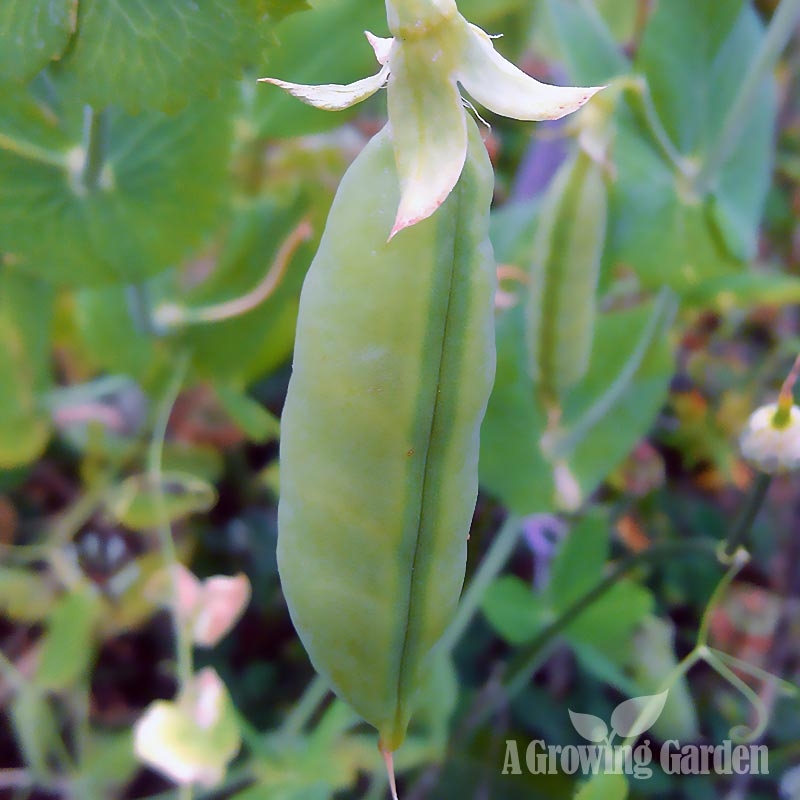 When mature, English peas have large, fat pods full of large, edible seeds. They have a tough, stringy pod with big, green peas inside. With English garden peas, only the inside seeds are eaten -- the tough, outside pod is not eaten. English garden peas are often also called Shelling Peas because they must be 'shelled' in order to harvest the peas. Snow peas have long, flat pods and there is often no or very small inside seeds. Snow peas are eaten whole and are a common ingredient in Chinese cooking (think stir fry!). Snow peas are not as sweet as other types of peas. Snap peas are a mix between English garden peas and snow peas. They are larger and sweet like English peas, but, like snow peas, snap peas can be eaten whole. Snap peas have edible tender pods AND interior seeds.